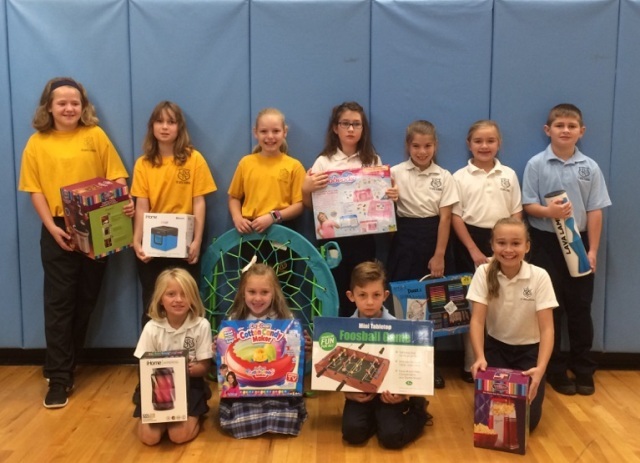 These students shared their memories of St. Rita School with us. The students sang "Hold on to the Memories" as their class song. The beautiful cake from the reception following the ceremony. Each student received their class shirt & video as a gift. Ready to process in for the Moving Up Day mass. Father receiving the Offertory gifts. 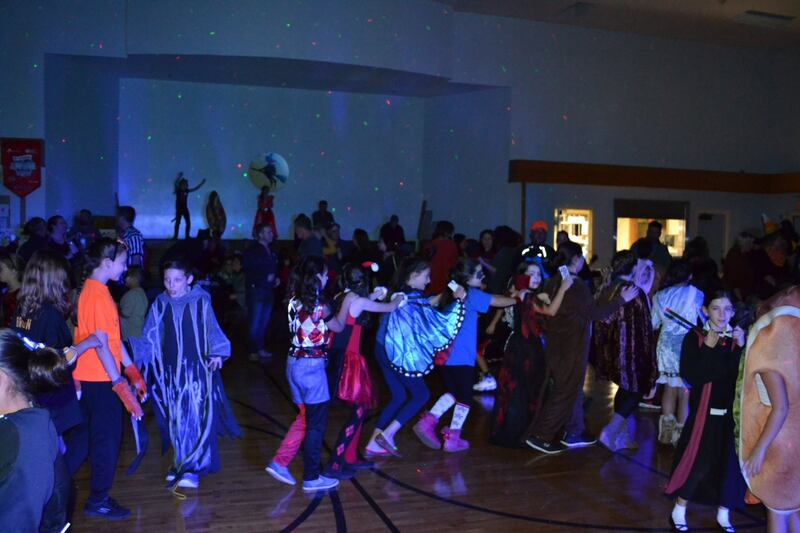 The 6th graders at the start of the meditational liturgical dance. 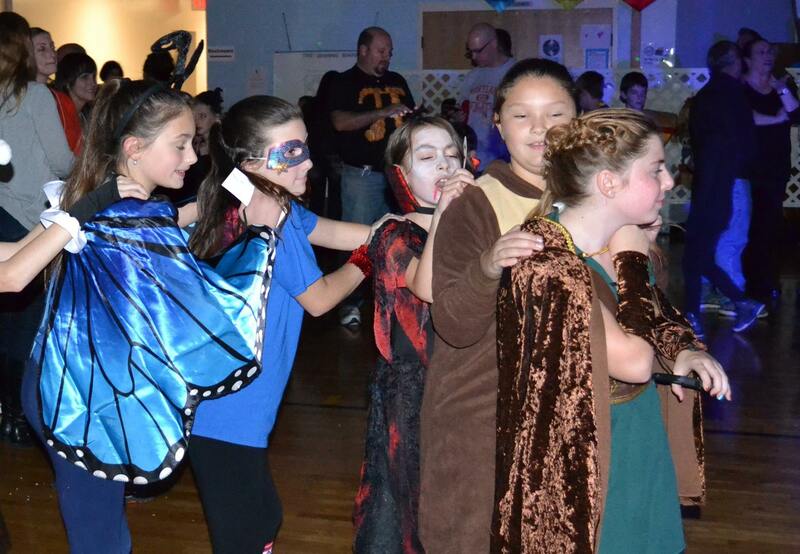 The 1st graders joined with the 6th grades for the dance. Master Showcase participants were amazing. Getting ready for the procession into Ascension Thursday mass. Talking with the Bishop before Mass. Did a great job on the second reading. The Bishop talked to the students directly during his homily. The students offering up the prayers of the faithful. The Bishop accepting the offertory gifts. 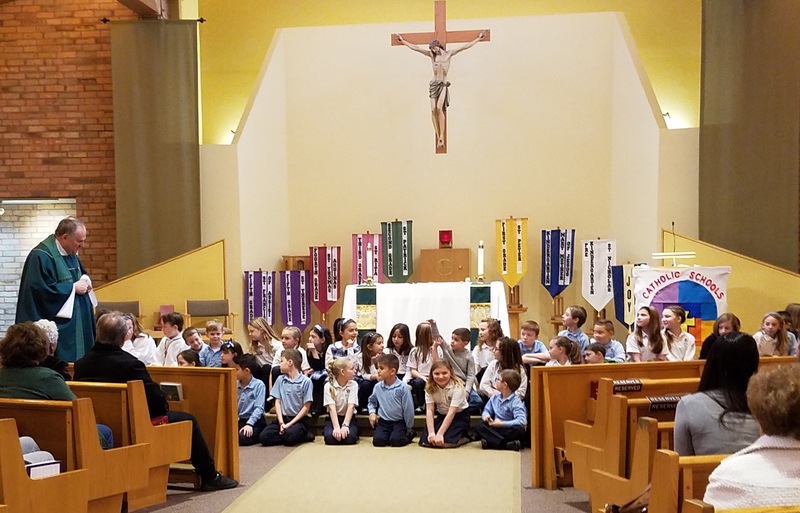 The 1st graders did a beautiful job on the Communion meditation song. Mrs. Merle shared how Mary is part of her life. The 2nd graders looked beautiful in their Communion outfits. Celebrated Teacher Appreciation with lunch & a special cake! Senior Tea centerpieces were beautiful. The 2nd graders entertained with their bell ringing. Everyone enjoyed the tea & cookies along with the entertainment. The 4th graders closed the program by singing "Alleluia"
Hats played a staring roll at the Blue-Gold Derby Ball. Flowers were a central part of many hats. Mrs. Wagner's hat sported both Blue & Gold. Gold team was well represnted. Winners representing the Derby infield attendees. Mrs. Tytler presented Mrs. Moore with her Hall of Fame Award. Mrs. Folger accepting her Hall of Fame award. 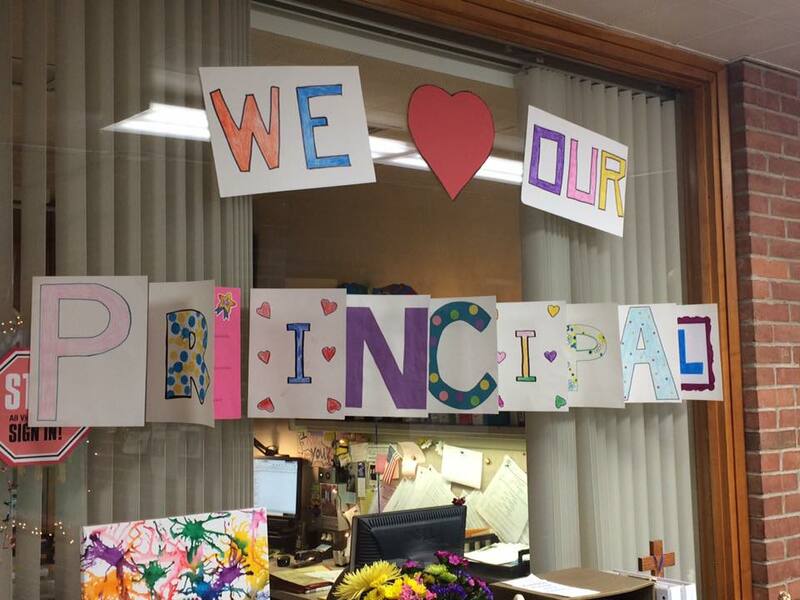 Showing love for our Principal! The 3rd graders singing at Grandparents Day. Students in Kindergarten to 3rd grade conclude the show for their grandparents. Those in attendance on Grandparents Day had a great time. Olweus Anti Bulling themes for the year. 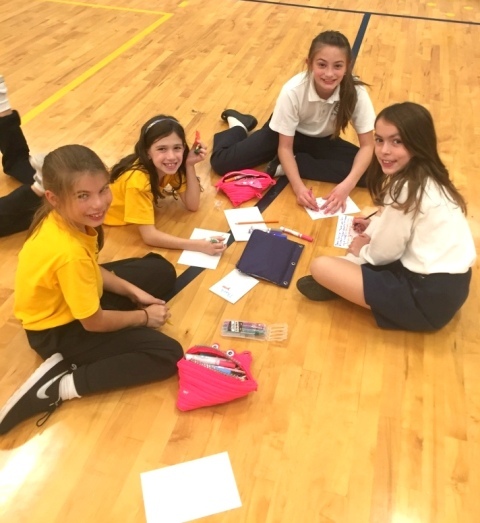 For "Visit St. Rita Day" students shared what they love about SRS. Sharing ideas of how to learn. 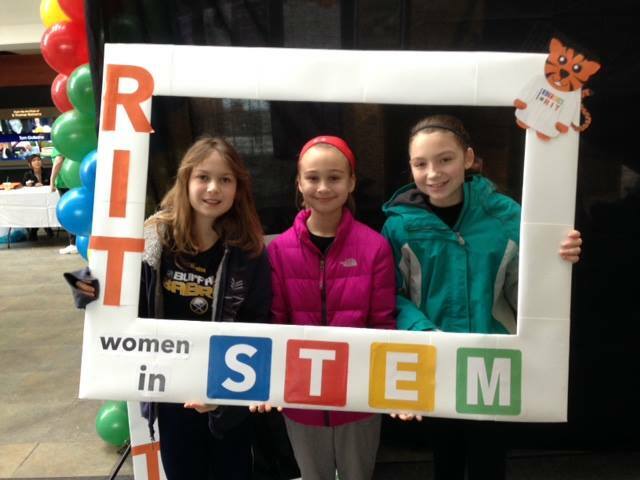 Students attended STEM Day at RIT. 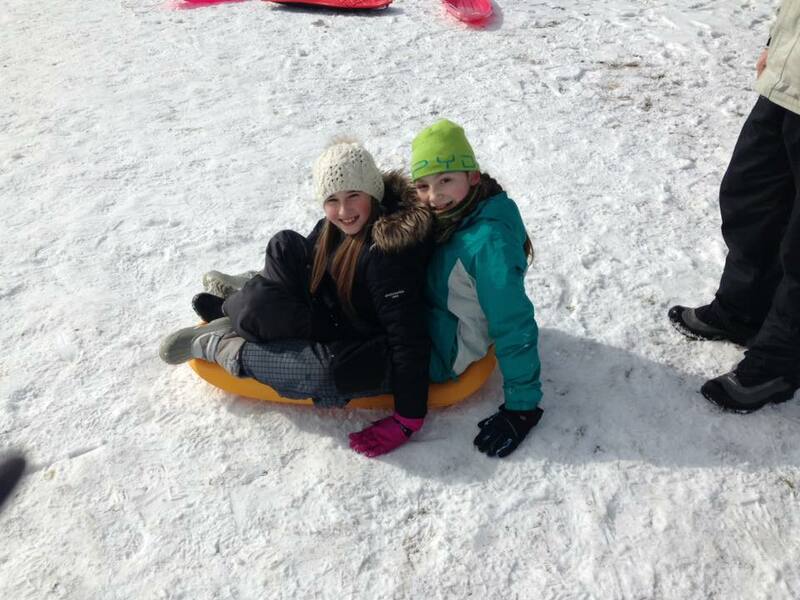 The Girls Scouts ran this year's "Warm is the Way to Be"
The final Winter Fun Day for the 5th graders! Using the snow shoes for the 1st time. Filling the bus loop with snow people. 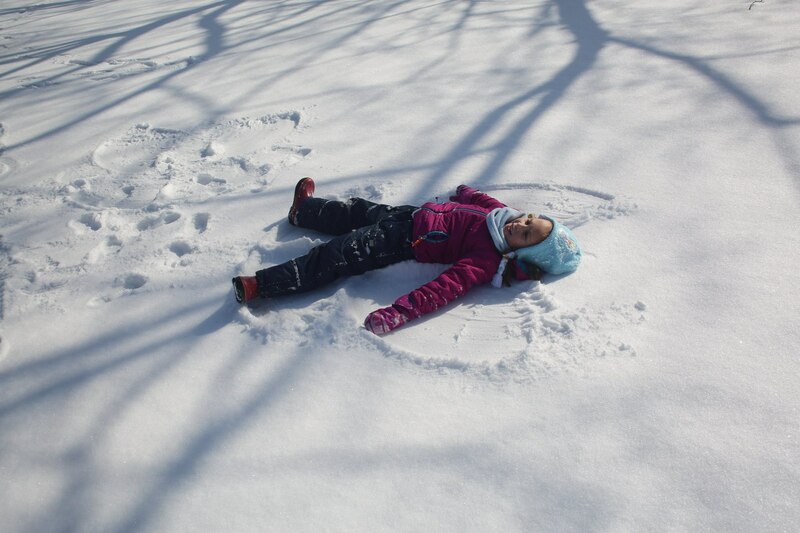 Making snow angels was such a fun activity. To conclude the week we have a "Soup-er Bowl" Day where we collect food for those in need. Wacky Day is a wild and fun filled day as the 2nd graders show. 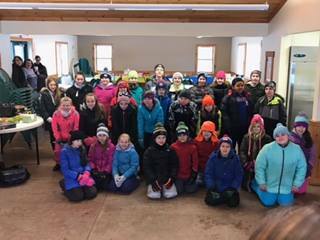 Here half of the 3rd graders show off their outfits. The remaining 3rd graders were proud to show you their outfits. 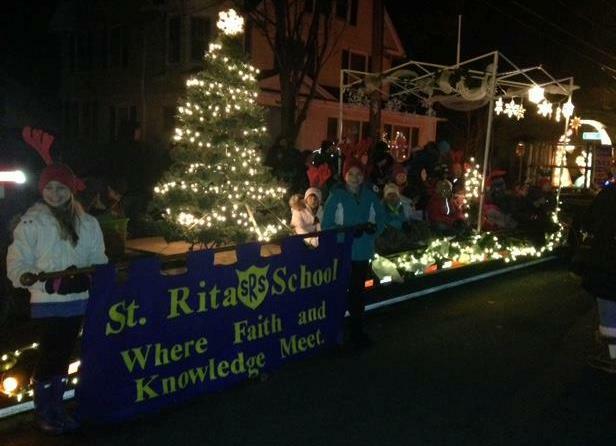 St. Rita students sang in the choir & Father G. was a concelebrant. 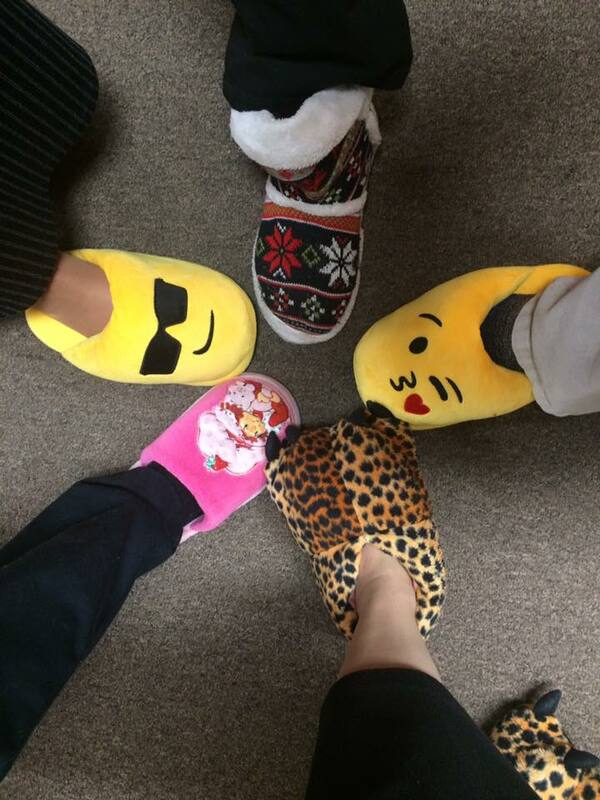 Slipper Day is enjoyed by all. 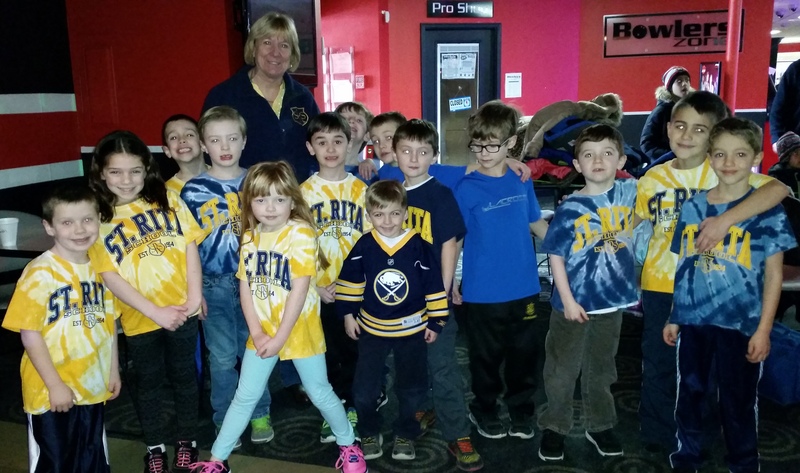 A field trip to go bowling is always a treat. 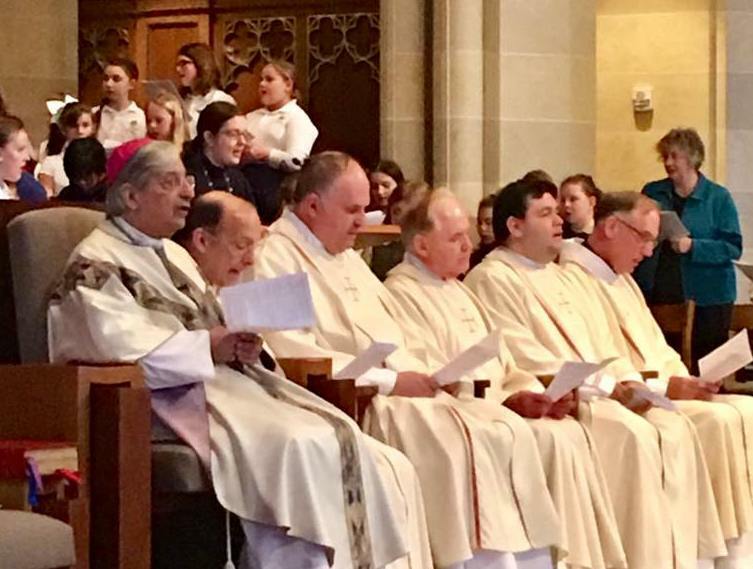 Welcome to Catholic School Week~Sunday mass celebration! The 1st readings for today done by brother & sister. 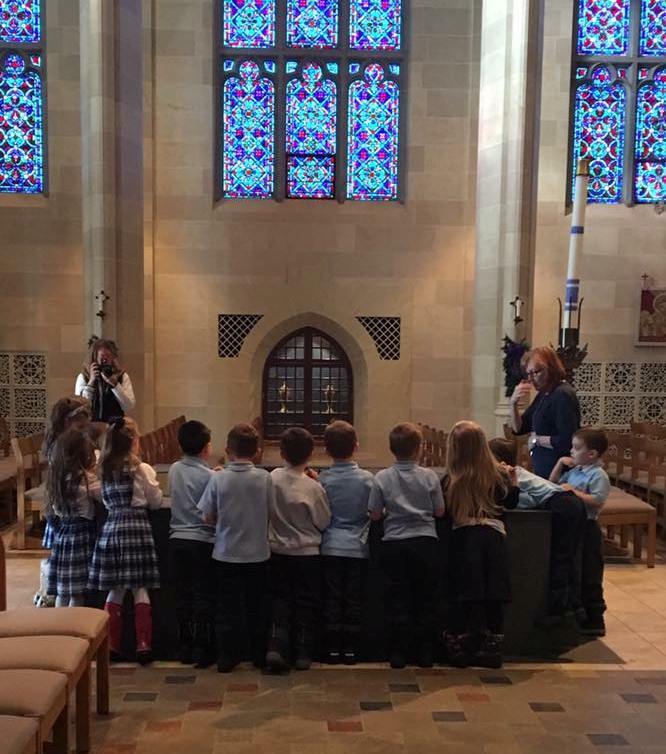 The 2nd reading for the day was done by 2nd graders. Father had students sit on the stairs for his homily. 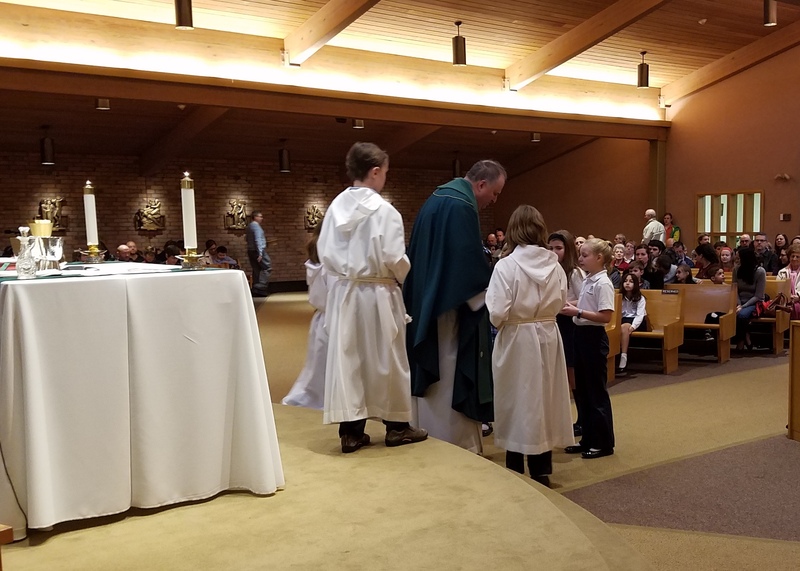 Prayers of the Faithful were done by students from various grades. At the annual Sing-A-Long the 5th graders chose "The 12 Days of Christmas"
Singing a song from "Holiday in Bethlehem" -- K,1st, & 2nd graders. 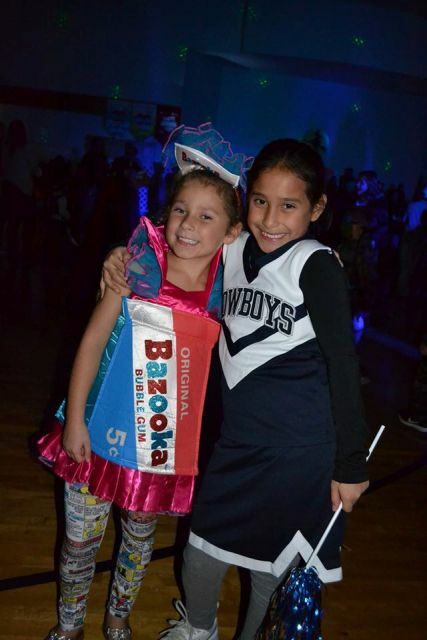 Our 3rd grades had fun with their song. The 4th graders sang a song from their Dec mass. 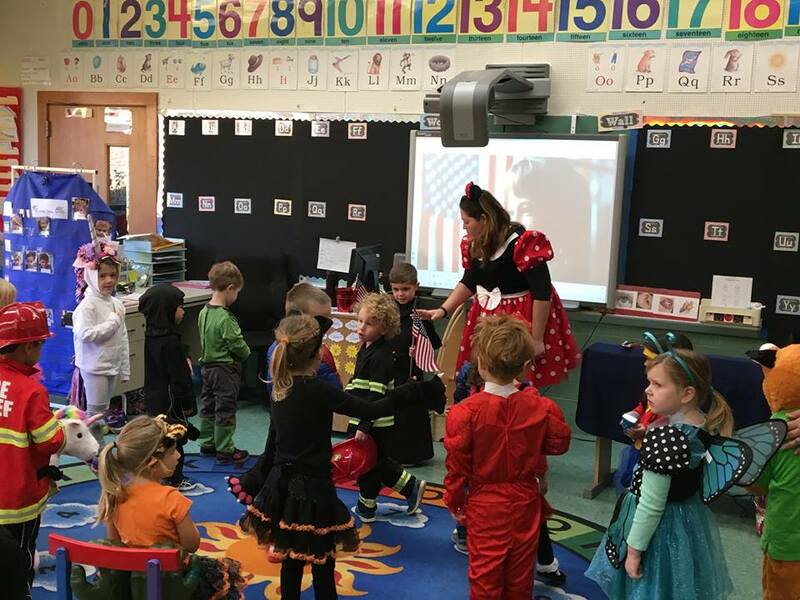 A special visitor came to Kindergarten. 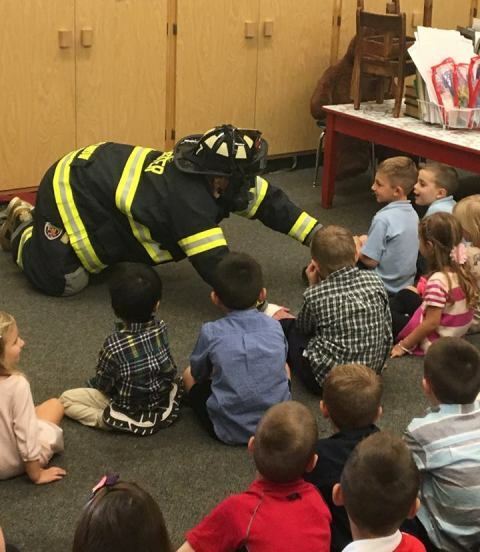 He also stopped in to see the PreK 3 year olds. 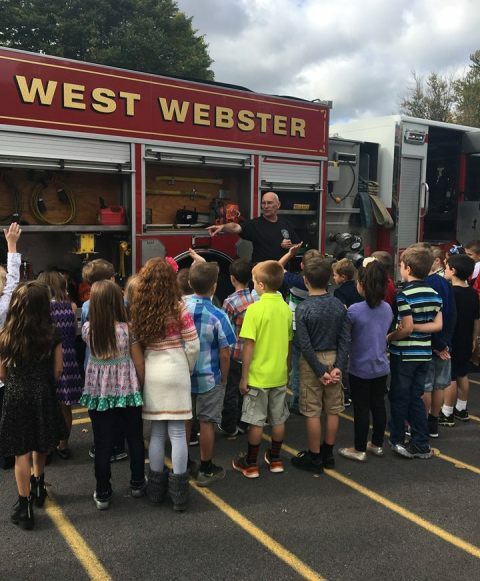 Even the 2nd graders got a visit. Thanks to Santa and his helper for stopping at school. 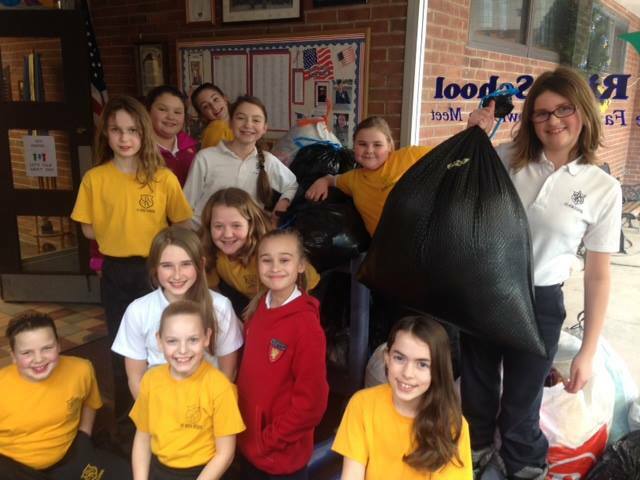 Helpers lined up all our donations for Daystar. Car packed and ready to go! Had fun delivering it all & they were overwhelmed by what we brought. Mary & Joseph couldn't find a place to stay. The manager at the Lost Chance Inn said they could stay in the stable. The Angel announces the birth of Jesus to all who gathered. 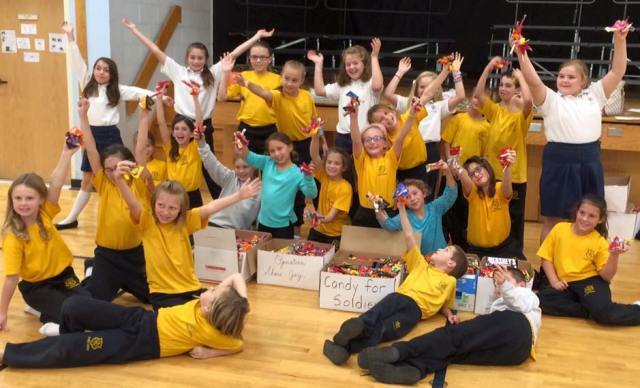 What a wonderful Christmas gift these students gave us! 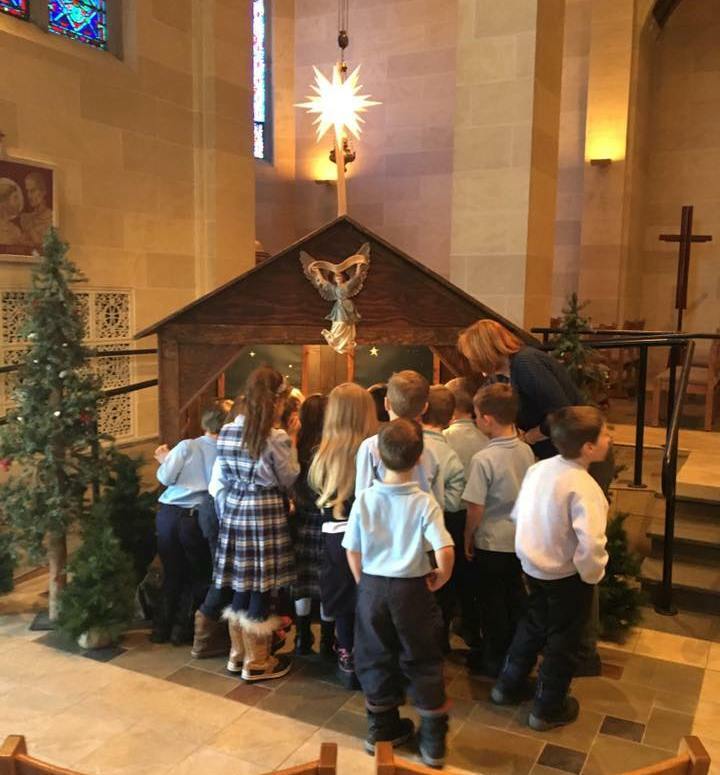 They loved the Cathedral's Creche. D.A.R.E graduates from Mrs. Sutley's class. 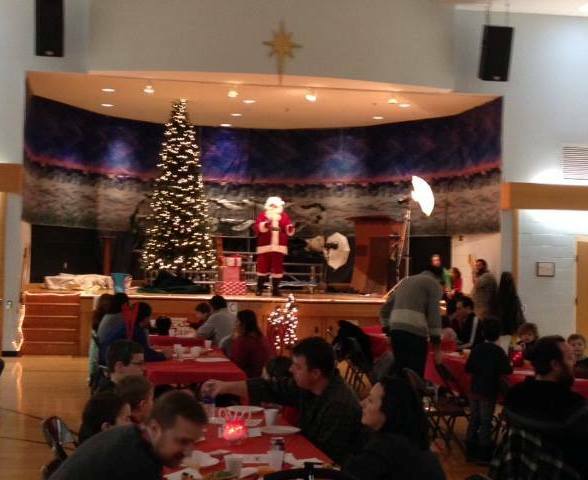 PreK & Kindergartners had a fun Breakfast with Santa. 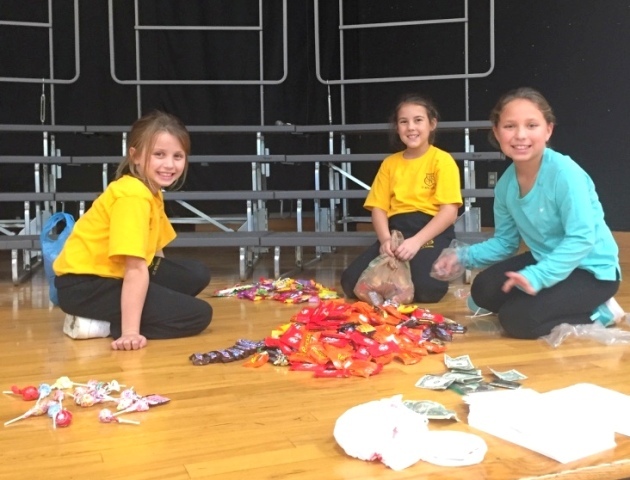 Teams of 5th graders explain the tradition of St. Nicholas to the lower grades. Everyone had fun being in the parade. 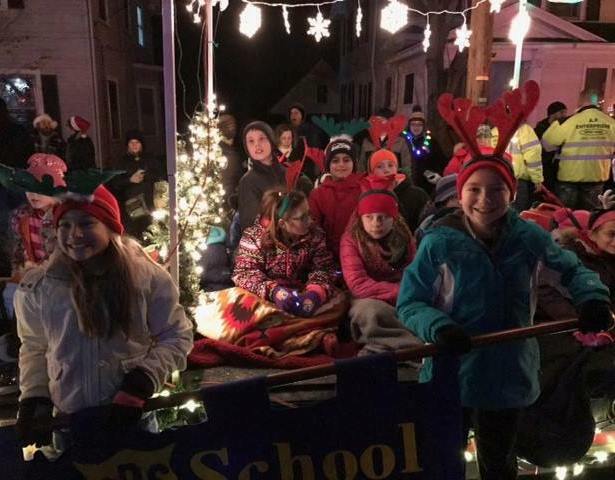 We marched in the Webster Winter Parade again this year. Mrs. Steadman was the 1st read at our Barnes&Noble Book Fair. Mrs. Wagner also read to the students. The 4th grade Girl Scout troop sang carols. 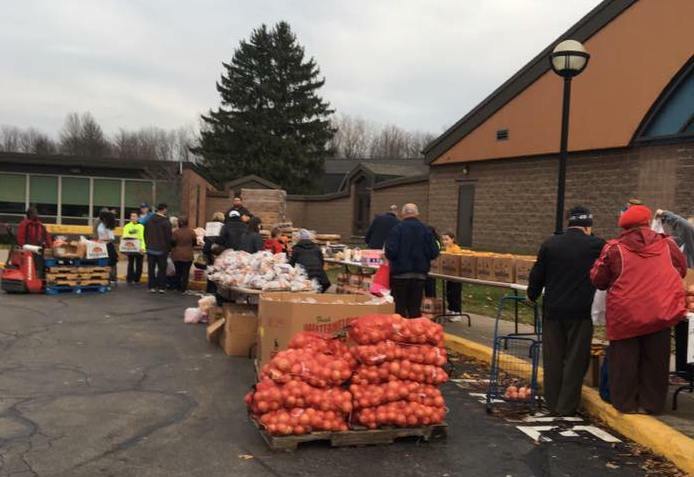 We hosted a Food Link distribution day. 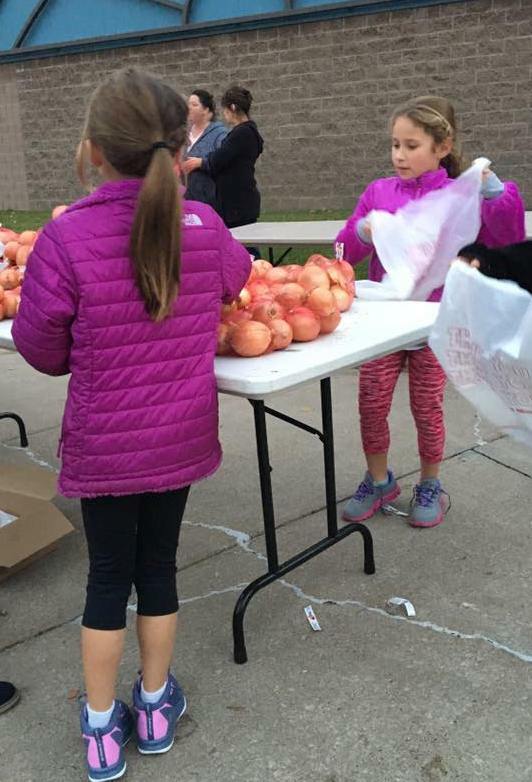 Students helped at the event. We gathered together for Thanksgiving.service. We gave thanks for all our gifts and blessed the food we collected. 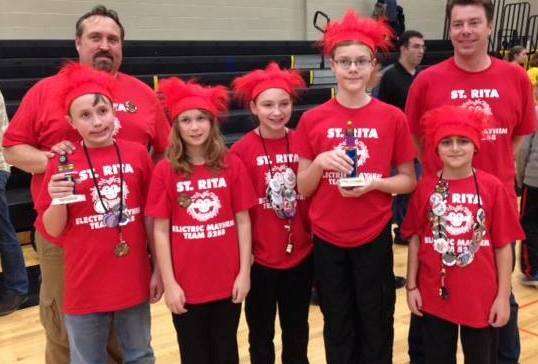 The 5th grade LEGO team is moving onto regional competition. All branches of the military were honored at our Veteran Day Service.. The students did a beautiful choral reading. The National anthem was sung by all. Thank you cards were give to all veterans in attendance. Jacob, an alumni, talked about children in conflict areas. Jacob and family with Mrs. Wagner. Hearing the results of our hard work at the Marathon. The prizes await the announcement of the winners. It was hard to pick a prize. In the end all were happy! 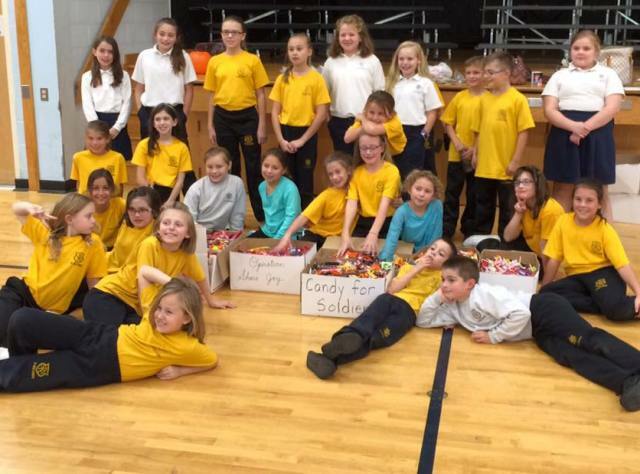 Sorting the candy from Operation JOY. Making cards for the soldiers to go with the candy. We all worked on this project. So we jumped for JOY. 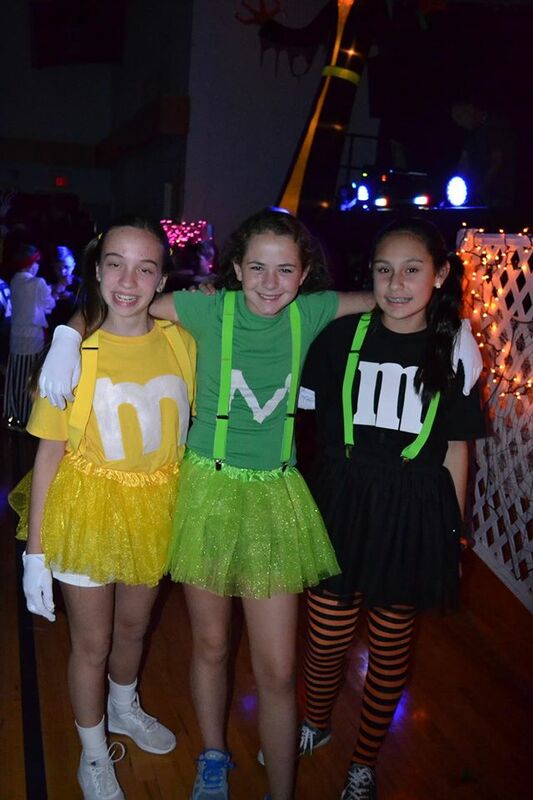 Friends at the Fall Family dance.. The dance line was a real treat. PreK 4 enjoyed their day too. A Friendly Welcome to the FrightFul 5K/10K runners. Getting ready to start the race. Alumni Luke crosses the finish line. Everyone finished and had a great time. 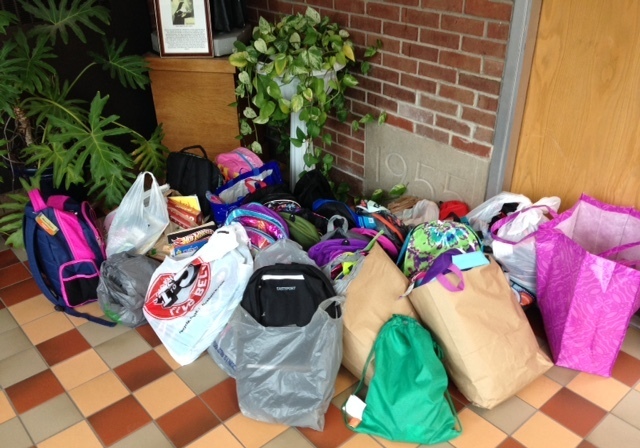 Backpacks for Foster Children was our Fall Service project. Just some of the many items collected for our Fall Service project. The Fall Book Fair all ready for the students to arrive. 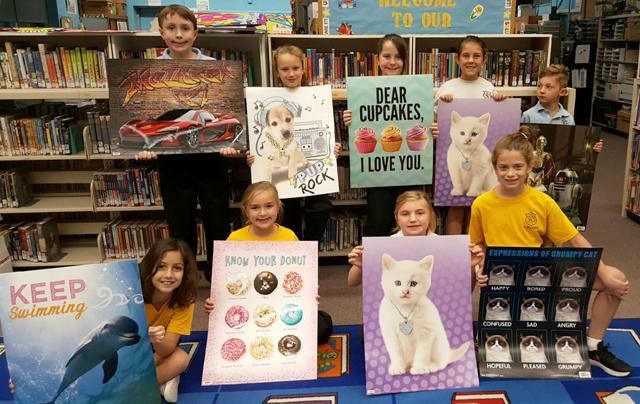 Winners of the displayed Book Fair posters. 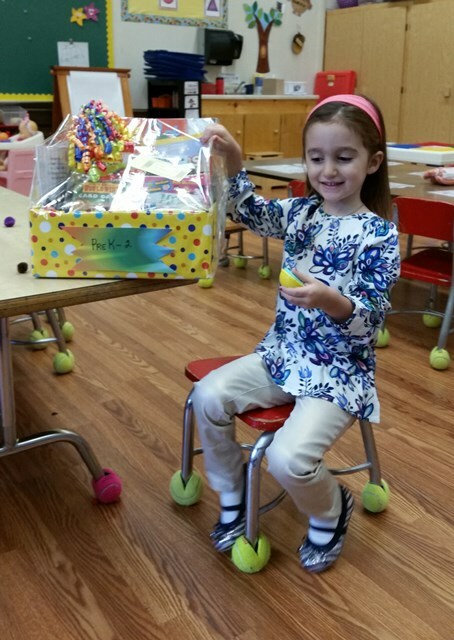 The PreK-3 raffle winner was so excited. 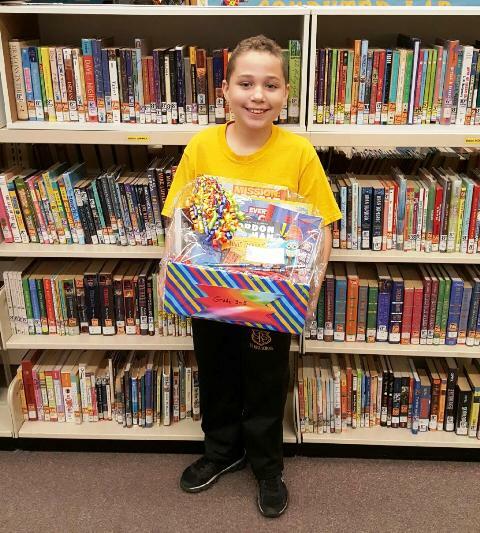 The grade 3-5 raffle winner showing off his prize. Learning all about the fire truck. Here's how you rescue someone in a burning building. This year was our 30th Annual Marathon! Two generations of alumni checked in. Hot dogs at 8:00am are a staple of the event. Some walked, some jogged and some even ran. Dad's on his 15th consecutive Marathon. An ice cream bar was part of the 30th party. Just some of the faculty who attended. Time out to watch the ducks in the pond. We didn't even disturb the fishermen. Look at all who showed up. A friendship bench sits in the entry to the Parish center. A frequent visitor outside Mrs. Wagner's office. Making new friends as we make sundaes at the New Family Social. Cool face painting by the older students. What fun we all had. Halls all ready for the students to arrive. The first to arrive in Mrs. Lemik's class. Mrs. Wagner greeted every bus to arrive. Father came to welcome us all back. Everyone was glad to be back. 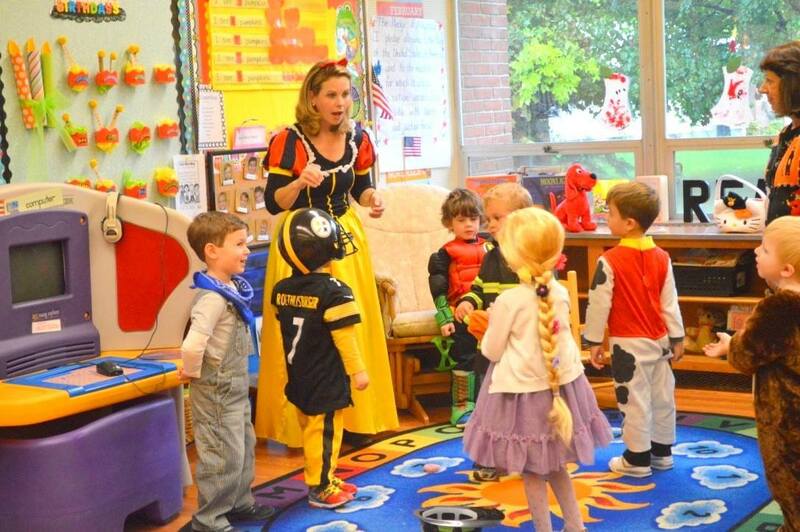 Meeting the new teacher is always exciting. To add to the day's excitement they started the new roof on the Parish Center.